In the song “NASA”, Ariana Grande uses literal space and other astronomical events as metaphors for the amount of distance she needs from a partner. And for those who don’t know, NASA is the acronym for the National Aeronautics and Space Administration, the agency of the US government that deals with the exploration of space. Ariana begins the track by telling her lover that despite his loving appeals, she has chosen to spend the night alone. There isn’t any specific reason why she has decided to do so. Yet she is adamant in establishing the fact that she is committed to passing the evening without his company. In the pre-chorus, Ariana indicates that this is not based on a desire to terminate the relationship. In fact even he knows that some time apart would be good. Rather missing him would increase her overall affection, and she can’t miss him if he’s present. 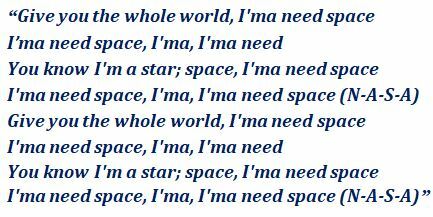 Then the chorus goes on to show that, being the woman whom she is, Grande is going to “need space”. She understands that her boyfriend desires her company. Yet in the name of self-discovery, she has elected to take some time off until the right moment comes around to get re-engaged in romance. It’s noteworthy to mention that many believe that the song “NASA” is about Ariana’s former boyfriend/fiance Pete Davidson. Ariana and Davidson began dating in 2018 shortly after she split from her former boyfriend Mac Miller. By June of 2018, the pair got engaged to be married. However, the engagement was called off in October of that same year. Writer(s): This brilliant track was co-written by Ariana Grande and several others. These several others include: Scootie, Tayla Parx, TBHits and Victoria Monét. Producer(s): Aside co-writing the track, Scootie and TBHits also did the production work on it. Album/EP: “NASA” is the third song from Thank U, Next, Ariana’s 2019 album and fifth studio album overall. Release Date: This track was made available for download and streaming on 8 February, 2019. Record Label: The record label responsible for releasing this song is Republic Records. 1st Interesting Stuff: Thank U, Next is the first of Ariana’s albums where she co-wrote every track, and as can be seen by “NASA” she has some skills! Along with “7 Rings”, this is the track on the album that Ariana had the most pleasure making. 2nd Interesting Stuff: The title of this song was teased in the official music video of “7 Rings”. Who sings the background vocals on “NASA”? That was done by the song’s co-writer Victoria Monét.